Popularly known as Bhutta, it's often seasoned with salt and buttered before serving. The glycemic index of sweet corn is 55 which is on the edge of the low GI category. It provides around 15.3 g of CHO in ½ cup of raw sweet corn, due to which the glycemic load is 8.4. Is Sweet corn safe for Diabetics? The ability to produce insulin is impaired in diabetes. Carbohydrates is the major form of energy and impact your blood sugar levels the most. It is recommended to include 45 to 60 grams of carbohydrate per meal depending on the blood sugar levels. 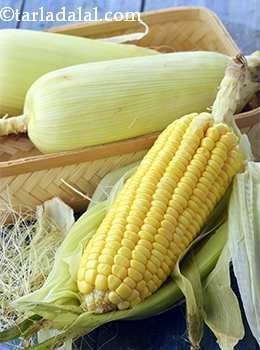 Starchy vegetables like sweet corn contains 15.3 g of carbohydrates in ½ cup that may raise your blood glucose levels. This is best understood by the glycemic load which is 8.4 that comes under low GL range. But still sweet corn can be a part of a healthy diet when consumed in moderation. Sweet corn has fair amount of fiber which will help you monitor your blood sugar levels. Remember to include sweet corn in your diabetic menu when you can limit your other source of carbohydrate rich food. Is Sweet corn suitable for Weight Loss? Healthy diet and regular physical activity is an important part of a healthy weight loss plan. The major aim of the weight loss plan is to burn calories more than you consume. ½ cup of raw sweet corn gives you around 61 calories and since it is a starchy vegetable, it does contain good amount of carbohydrates (15.3g in ½ cup). Having too many carbohydrates can lead to weight gain and best to consume sweet corn in very small amounts. The key is to reduce the amount of carbohydrates per meal so that your overall calorie intake is reduced. The fiber content in sweet corn also add bulk to the meal. Thus controls your appetite.